The Eagle County Regional Airport could see more demand as traffic worsens along I-70 (EGE photo). The distance (120 miles) between Vail and Denver International Airport along Interstate 70 isn’t really getting any bigger. It just seems like it after a 2013-14 winter that frequently saw drive times in excess of four or five hours. The biggest problem is cars and trucks going sideways on snow-choked high-mountain passes that soar to more than 10,000 feet (Vail Pass and the Eisenhower Tunnel), but things can be dicey all the way through the Front Range foothills. Now comes word of the Colorado Department of Transportation’s plans to rebuild the last of the state’s “30 Worst Bridges” before something bad happens: the crumbling I-70 viaduct just north of downtown Denver. Neighborhood groups are up in arms, but the state’s ski and tourism industries may also want to take serious notice. Drive times between mountain resorts and DIA – already bad during adverse winter weather and peak summer traffic – will be a whole lot worse during construction. The only good news is that the Regional Transportation District’s 28-mile light-rail line from DIA to downtown Denver’s Union Station will be open by 2016, so domestic and international visitors can simply bypass the I-70 viaduct mess by rail. Too bad trains don’t continue on up to the state’s key mountain resorts in Summit and Eagle counties. CDOT is hiring an I-70 corridor traffic coordinator to implement a number of strategies to reduce closures and delays along the key mountain stretch, but policy makers are watching closely. Colorado state lawmaker Diane Mitsch Bush is weighing legislation that contemplates limiting commercial truck traffic on I-70 during peak periods and could include traction checks and potential fines for private vehicles with inadequate snow tires or no chains. All of this could help spur more flights and perhaps even international customs into the Eagle County Regional Airport, which is just 35 miles west of Vail on I-70 and can handle aircraft the size of Boeing 757s. Vail Mayor Andy Daly is worried Colorado will lose market share to states like Utah, where Park City – recently acquired by Vail Resorts – is just 40 minutes from the Salt Lake City International Airport on Interstate 80. For the 2014-15 ski season four major airlines – Air Canada, American, Delta and United – offer nonstop flights from 11 cities to and from the Eagle County Regional Airport (EGE), including Newark and JFK in the New York City area, Houston and Dallas in Texas, Atlanta, Miami, Denver, Chicago, Minneapolis, Los Angeles and Toronto (Eagle’s first international flight). “Right now I think about 35 percent of our [destination] skiers are coming through Vail-Eagle [County Airport], but more and more are going to be looking for it based on I-70,” Daly said. Greg Phillips, aviation director at the Eagle County Airport, says the goal is to grow the number of passengers on existing flights and to possibly add more cities for next ski season. The Eagle airport is also studying the financial feasibility of adding international customs for more direct flights from other countries such as Mexico. He acknowledges the growing importance of the Latin American market to Colorado’s ski industry. More flights, of course, would mean more competition and lower airfares from key U.S., Latin American and European cities. On average, it costs about $230 more to fly in and out of Eagle versus DIA last year, Phillips says. But he’s increasingly seeing people willing to pay that premium to avoid I-70. “Anecdotally, I hear from people who say I would much rather fly into Eagle and I’m willing to pay more to be able to avoid the time, the hassle, the drive, the parking, the potential impacts on the road from the drive itself to be able to fly directly in here and just take a quick shuttle up-valley,” Phillips said. Phillips says the Eagle airport saw a pre-recession peak of 232,000 enplanements in 2007, which dipped to about 167,000 last year. But he feels that number has bottomed out and demand will continue to increase, allowing for more direct flights to more destinations in the future. 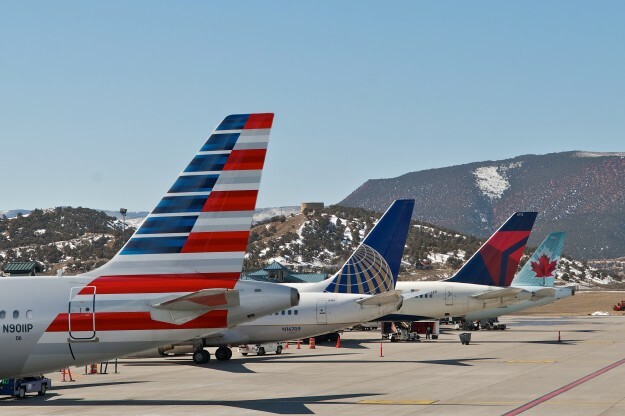 Stay Aspen-Snowmass President Bill Tomcich recently told the Aspen Times that the number of commercial airline seats into Aspen will be higher than Eagle County this coming ski season, as the number of seats into Eagle has declined steadily over the past eight years. David O. Williams is an award-winning freelance reporter based in the Vail Valley of Colorado, writing on health care, immigration, politics, the environment, energy, public lands, outdoor recreation and sports. His work has appeared in 5280 Magazine, American Way Magazine (American Airlines), the Anchorage Daily News (Alaska), Aspen Daily News, the Aspen Times, Beaver Creek Magazine, the Chicago Tribune, the Colorado Independent, Colorado Politics (formerly the Colorado Statesman), Colorado Public News, the Colorado Springs Gazette, the Colorado Independent (formerly Colorado Confidential), the Colorado Springs Independent, the Colorado Statesman (now Colorado Politics), the Daily Trail (Vail), the Denver Daily News, the Denver Post, the Durango Herald, the Eagle Valley Enterprise, the Eastside Journal (Bellevue, Washington), ESPN.com, the Glenwood Springs Post-Independent, the Greeley Tribune, the Huffington Post, the King County Journal (Seattle, Washington), KUNC.org (northern Colorado), LA Weekly, the London Daily Mirror, the Montgomery Journal (Maryland), The New York Times, the Parent’s Handbook, Peaks Magazine (now Epic Life), People Magazine, Powder Magazine, the Pueblo Chieftain, PT Magazine, Rocky Mountain Golf Magazine, the Rocky Mountain News, Atlantic Media's RouteFifty.com (formerly Government Executive State and Local), SKI Magazine, Ski Area Management, SKIING Magazine, the Summit Daily News, United Hemispheres (United Airlines), Vail/Beaver Creek Magazine, Vail en Español, Vail Valley Magazine, the Vail Daily, the Vail Trail and Westword (Denver). Williams is also the founder, publisher and editor of RealVail.com and RockyMountainPost.com.